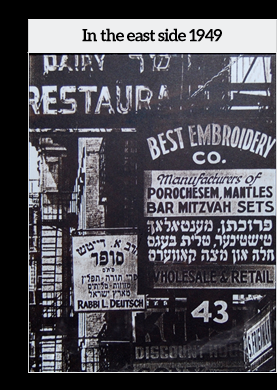 Best Embroidery, established in 1949, has been serving the Jewish community for more than 60 years. It began in the Jewish neighborhood of the Lower East Side of Manhattan. Over the many decades we have been in business, we’ve adhered to a simple principle: Retain traditional values while keeping in touch with the modern world. This creed has served us well! At our current large, luxurious showroom in Brooklyn NY, our professional artisans create the most unique products according to each individual’s specifications. Our items are hand-crafted, created with the highest quality materials. Embroidery is done on premises, stitch by stitch, guided by the best in this creative field. Our designs are adorned with genuine Swarovski crystals. Best Embroidery’s work is found all over the globe. From exquisitely embroidered ark curtains and crystal Torah coverings, to classy sterling Torah ornaments, our products adorn countless synagogues worldwide. If it’s unique and beautiful, chances are good it was created by us. 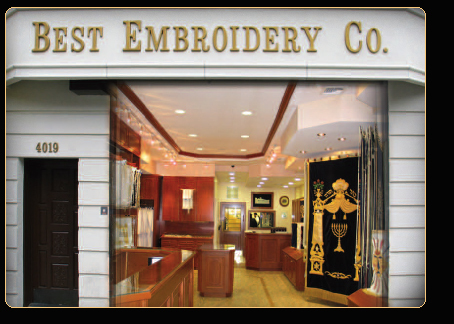 Best Embroidery is a one-stop shop for all your Torah accouterments. We carry Torah covers, Torah pointers, dazzling silver crowns, magnificent AtzeiChaim breastplates, and more. The convenience of having all of this in a single, centrally located spot, cannot be overestimated. We offer complete customization. Fabrics, designs, colors, sizes, tassels, crystals, thread type, sterling, hand work, machine work… every aspect is chosen and determined by you. Our elegant showroom at 4019 14th Avenue, Brooklyn, showcases a beautiful display of designs as well as an array of fabric and embroidery choices. These are meant to inspire you. If, however, you already have a dream design for your product, we will make your wish a reality. Unlike typical companies that offer you a stock catalogue, Best Embroidery truly customizes to your precise requirements, down to the most minute detail. Our designers, embroiderers and artisans are on premises throughout the workday, available to discuss your many options. We gladly work with your synagogue’s interior designer if you have one. Otherwise, our in-house designers can suggest a host of options to match your synagogue’s décor. Browse our site to see some of the products we offer. And by all means, stop by and pay us a visit! We look forward to meeting you.